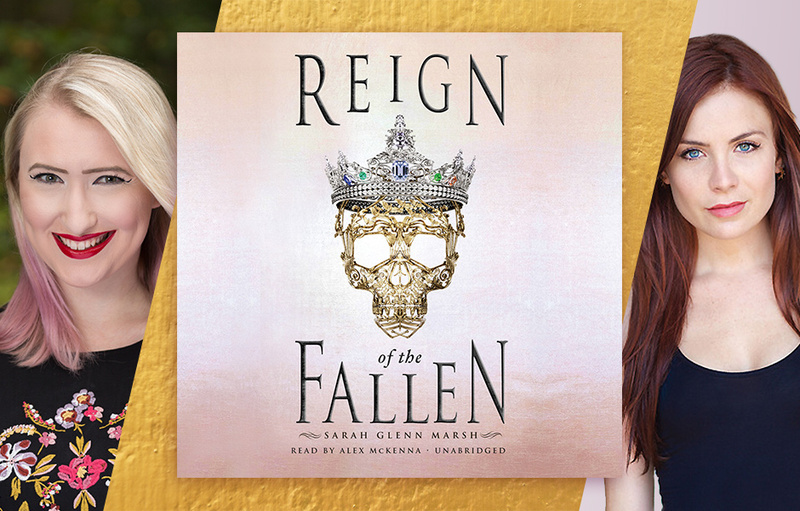 Author Sarah Glenn Marsh chatted with narrator Alex McKenna about her experience voicing Reign of the Fallen (Alex McKenna also returns to narrate the forthcoming sequel, Song of the Dead). Reign of the Fallen is aabout Odessa, a master necromancer, who must fight against a gruesome plot in order to save her kingdom. It is a dark, action-packed audiobook featuring a strong female protagonist. It’s a fantastic YA fantasy worhty of listening in one sitting! Sarah Glenn Marsh: Do you have a favorite character from Reign of the Fallen? Tell us who, and why! Alex McKenna: Reign of the Fallen is filled with amazing characters. I fell in love with every single one. Valoria really stood out to me because she isn’t your typical princess. I love how brilliant her mind is and how that can exist simultaneously with an acute kindness. SGM: As you know, Reign of the Fallen has a magic system based on eye color. Given that, which type of mage would you be if you lived in Karthia? AM: If I were in Karthia, I think I would want to be green-eyed and just like Meredy: a beast master. SGM: What was your favorite scene to record in Reign? AM: Spoiler alert: I think Sparrow’s detox was my favorite to record. The scenes were so nuanced and to have so many strong women interacting was a blast to portray. SGM: When it comes to acting vs. voice acting, is it harder to get into and stay in the main character’s head when you’re in a recording studio (rather than surrounded by other actors and sets and costumes)? Do you have any tricks for staying in character while recording an audiobook? AM: Voice acting is quite unique. It’s apples and almonds compared to acting with one’s own body and visage. Voice acting can be animated series or commercials, and audiobooks are a very particular niche. It’s like running a marathon with your voice but, to me, it’s the purest form of storytelling. I have been very lucky to get to record great writing…and when the writing is good, it’s easy to stay in the story. The only trick of mine that comes to mind is that, when I’m prepping, I underline each character with a different color so I can flow seamlessly from the different voices/personalities as I read. SGM: What’s the hardest thing about the audiobook recording process? Your favorite part? AM: The hardest thing about the audiobook recording process is…sitting still. When recording it’s important to be as still as possible. You need to always be in the same place and position so the sound is consistent, unlike recording animation, where you typically stand and have more freedom of movement. My essentials when recording audiobooks are throat coat tea, cut up green apples to take bites of (it helps with reducing the smacking of lips sound) and loads of snacks. My favorite part is getting lost in the story. I love really connecting with all the characters and conveying their feelings as I get to read aloud the author’s vision. SGM: Aside from Reign, can you tell us about any favorite listens? AM: I really love historical fiction and, come to think of it, history in general. I just recently listened to Vanessa and Her Sister written by Priya Parmar, a full cast production with very talented performers. It centers on the Bloomsbury group and the dynamics amongst them. My absolute favorite podcast right now is You Must Remember This by Karina Longworth. Karina examines forgotten or never told old Hollywood stories. I recommend it highly. And, the story continues with Song of the Dead! Odessa is determined to explore beyond Karthia’s waters in this next installment.